The Commodore PET had an all-in-one form factor where the monitor was fused into the rest of the computer, making a single unit, not dissimilar to some early terminals like the VT100. This is undesirable; it makes the computer hard to lift safely, the monitor impossible to position ergonomically, and if either the main unit or the monitor goes on the blink, you can't swap out or return just that part; hence, later computers moved away from this design. Given the undesirability of this design, why was it done? Is it substantially easier or cheaper to design that way? Does the answer change when you move from early 10-12" monitors up to a full 14" monitor? It's a little cheaper to build all-in-one units because you only need one cabinet and one power supply, and you need fewer cables and connectors and supporting electronics. And back then, people didn't often have monitors that they could reuse on new computers, just televisions which often had only RF inputs and couldn't produce a sharp image for text. So as long as you didn't have a monitor anyway, it made financial sense to buy a computer with one built in. You mentioned ergonomics, but this wasn't on people's minds back then. Computers back then were more repairable. Often the repair manual and schematics even came with the computer. Since then we've moved from discrete components that anyone with a soldering iron and multimeter could fix, to integrated surface mount circuits and other components which require specialized training and tools to repair. People didn't throw away nonworking TVs back then. They took them to the repair shop. Today if your monitor dies, good luck finding someone who can fix it for a lower cost than a new monitor! One last thing. Even today, all-in-one computers are still very popular. We call them laptops. Most of the problems that you list were simply not considerations in the mid-70's. The Commodore PET was not hard to lift safely. Its monitor (in the 40 column variety at least) was tiny and didn't contribute as much to the machine's weight as the vast quantities of sheet steel used in the construction of the case. And don't forget that it was a novelty to be able to move a computer at all by hand. Before microcomputers, even small computers like the PDP-11 typically consisted of a couple of large boxes mounted in a 19" rack and a teletype for the main console. Ergonomics? Don't make me laugh. Nobody thought of ergonomics in those days, at least partly because very few people had jobs that meant they spent long periods of time in front of computers. Repair was a lot easier than you might think. 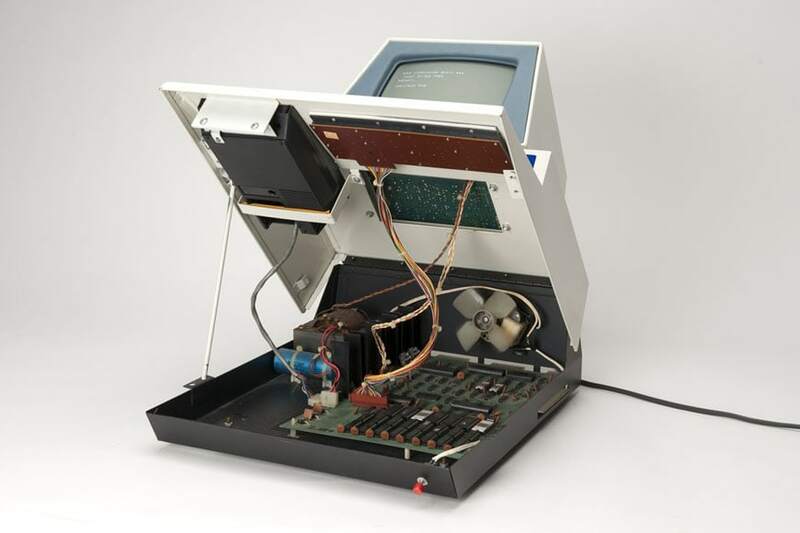 With the Commodore PET, the entire top of the case was hinged at the back and there was a metal strut inside that you could use to prop it open like the hood/bonnet of a car. It was a fairly simple matter to swap out the circuit board. In fact, when my parents upgraded their PET from 16k to 32k ("we won't use that much in a lifetime" -- my Dad, 1979) the shop effectively replaced the entire computer with a new one i.e. they swapped out the motherboard. IIRC the monitor unit was bolted on to the main case so that could be swapped out easily enough too. Why was it done? Well, of course in some cases, it wasn't done. If you bought an Apple II, you bought the monitor separately. However, I think the thinking at Commodore was that, by integrating everything, they could market the PET as a "one stop" shop. Certainly with the original PET, which also had an integrated tape recorder, you bought one thing and then you were ready to go. This was probably a big selling point at a time when most people looking to buy a computer had never seen a monitor before they walked into the computer shop. Indeed, the PET likely took a lot of design ideas from "dumb" (actually semi-intelligent - very few of these weren't simple microcomputers inside!) terminals of the 70s, and kept the non-detachable keyboard. It was how a commercial computer workspace was expected to look like in that era. Where did the dumb terminal makers get the dumb idea? Electric typewriters and teletypewriters, often used for very early computer systems, which "glass teletypes" (CRT terminals) were intended to replace. These very rarely came with detachable keyboards, often because the linkage between the keyboard and the rest of the machine was part-electronic and part-mechanical. Three other reasons are conserving space, design aesthetics, and portability. The original Macintosh was an example of how to use the form factor for portability, you could get a fabric carrying case to hold your mac + keyboard, and take it back and forth between locations. I actually did this, it was probably at the weight limit for easy portability back then, and well over what we would accept today. The iMac is an example of space conservation and design aesthetics. Essentially an iMac takes up little desk space. But it's not much of a savings over a floor PC (unless you have little space under your desk), so it appears Apple's real motivation is design aesthetics. An iMac only requires a single power cable, so your desk can look cleaner and more professional (assuming you don't have papers all spread about). Not the answer you're looking for? Browse other questions tagged crt-monitor commodore-pet vt100 or ask your own question.